Amaya Gaming, the creators of PokerStars, brought on StarsDraft as their daily fantasy sports platform. Originally, StarsDraft was named Victiv when it first launched in 2014. However, the name was changed upon Amaya taking over ownership in 2015. Victiv grew quickly into one of the top Daily Fantasy Sports sites on the Internet. However, with its purchase by Amaya, the parent company of PokerStar, Victiv has become completely rebranded. As of now, StarsDraft is in a tier lower than the mega companies FanDuel and DraftKings. Although the already established Victiv team will remain on board to manage the business, it will be refurbished from the ground up as StarsDraft.com. Though, the Victiv team will ensure that the games at StarsDraft will remain as user-friendly as ever, as they will still use Victiv’s innovative software. StarDraft is set out to be even better than Victiv since it will keep Victiv’s innovative platform and mix it with the expertise of Amaya to make StarsDraft an enormous contender in the world of Daily Fantasy Sports. StarsDraft opened its website in September 2015, about a month after Amaya and Victiv reached their agreement for Amaya to acquire and rebrand the Daily Fantasy Sports site. StarsDraft initially was interested in Amaya for its innovative features and tools and clean interface, as well as its extensive gaming formats and sports offerings. StarDraft is not just a site worth checking out, but one that might take the lead as the top Daily Fantasy Sports website currently available due to its close ties with the poker community and its massive growth. If you are new to StarsDraft, you can receive a matching bonus to as much as $1,000 once you make your first deposit. On top of this, you will collect three tickets to build your bankroll. These tickets let you enter into contests to win real money. The additional tickets will be released by making deposits of at least $10. One downside of StarsDraft is that their bonus is released at a rate that is behind the industry standard. Bonuses get released at a two percent rate, which means that for every $100 you spend only two dollars will be released instead of the norm of four dollars. One of the best things about StarsDaft is the very generous Deposit Bonus offered to all new players. StarsDraft offers new players a 100 percent matching bonus for as high as $1,000. This means that if you deposit $1,000, they’ll match your deposit with another $1,000. However, one downside of StarsDraft is that the deposit bonus unlocks at a 2 percent rate while most other Daily Fantasy Websites open at a 4 percent rate. This means that if you enter $100 into a game, you will receive $2 as a bonus. Besides the free money, StarsDraft also has a unique gift of three “bankroll builder” tickets. These tickets let you enter into real money contests with no entry fee. StarsDraft is big on promotions and so not only do they offer the matching bonus, but also many other cool opportunities. For one, the loyalty program allows you to get your hands on cash just for trying out games. You can then turn this money into game tickets. There are different levels of loyalty tiers so you can move your way up the more you play. StarsDraft uses a similar salary cap format to the majority of other websites. You can play games with Major League Baseball, National Football League, National Basketball Association, Professional Golf Association, and the National Hockey League. Because StarsDraft has gameplay availability for European sports, there are some who believe soccer will soon be added to the roster. StarsDraft has one of the best gameplay availabilities currently on the market. They currently have four different kinds of games in each sport that they offer. Player salaries on StarsDraft are extremely unique. Salaries are algorithmically set to be as predictive of actual athlete performance as possible. StarsDraft ensures that there is no bias towards any positions. Additionally, the algorithms are refurbished on a regular basis and the methods utilized are innovative. This gives StarsDraft one of the best salaries in the gaming industry. • In this type of gameplay, opponents are chosen at random from a player pool. • This is a 4-20 player game that pays the winner at a small percentage of the entire field. • Meant for those players who do not want to spend too much money. Satellite games let players win their ability to play in a tournament at a very slight cost. • Double-up contests will pay out half of the field. • On the other hand, if you are in the bottom half you’ll leave with nothing. Amaya has entered the European markets in their PokerStars venture, and so it would not be a stretch that you’ll soon see soccer and other European leagues available shortly. This type of gameplay gives half of the field a payout. This means that if you enter a $10 standard game with 100 other players, the top half will win a payout, and so you only have to beat 50 percent of the other players to win. This type of gameplay has you attempting to double your money. Once again, half the field will win a payout. This is very similar to the cash games and head to head as you have a 50 percent chance of winning. Victron is an incredibly clever feature that is only available on StarsDraft and at no other Daily Fantasy Sports websites. This function will create a lineup for you using the statistical categories that you pick. 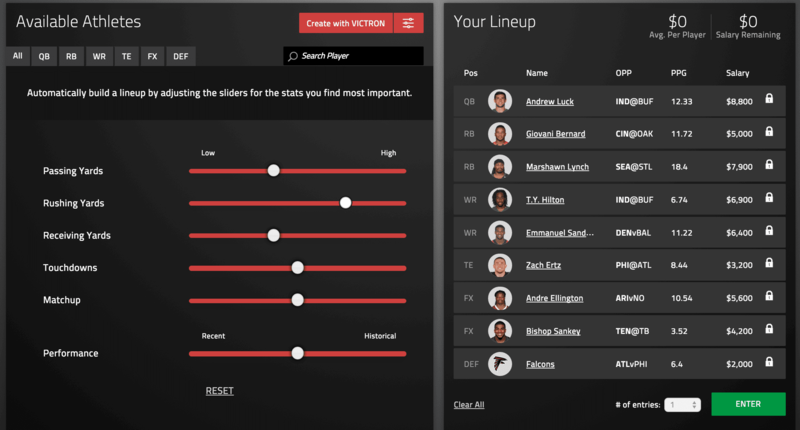 You simply must drag sliders to the position that you want, and Victron will build you a roster suggestion using a preset algorithm. You can then adjust the players you want to keep around so that your starting lineup is up to par. StarsDraft’s platform is extremely intuitive and simple. Its lobby for contests and offerings has been designed similar to the majority of other Daily Fantasy Sports operators. As of right now, there is no other way to access StarsDraft other than through its web application. However, its browser-based client is compatible with the majority of browsers including Internet Explorer, Mozilla Firefox, and Google Chrome. The website is also optimized for mobile use. However, there is no mobile app as of yet. That being said, with the acquisition by Amaya Gaming that will likely soon change. Amaya plans to give access to its StarsDraft platform through their PokerStars 7 client. CEO of Amaya, Matthew Primeaux has stated that users will likely have access to a mobile app at the beginning of the 2015 NFL season. StarsDraft is available on all devices and is for sure one of the most attractive fantasy sports apps out there. It's easy to navigate and use. The NFL rosters at StarsDraft use RB, RB, QB, FLX, FLX, TE, WR, WR, and a DEF. You may not choose a roster position for the kicker with StarsDraft, which can actually be a huge benefit to players. StarsDraft’s NBA rosters are pretty standard. However, one unique feature is that StarsDraft has a “SUB” position. Once you’ve drafted 3 F’s, 1 C, 2 FLX’s, and 2G’s, your last player will be the sub. You can choose a sub out of any player who has a salary cap of $5,000 or less. This player does not affect your salary cap while creating a team, and your sub’s score only is counted towards your overall score if it surpasses a player in your lineup. Essentially, a sub lets you pick nine NBA players and take the eight best scores to be counted towards your overall score. One crucial component of any Daily Fantasy Sports website is the interface and StarsDraft does not slack in that department. In fact, they have one of the best interfaces in the entire industry, with an incredibly sleek new look. With the change of ownership to Amaya, the interface has changed to a much darker look, which gives it a more similar appearance to “Poker Stars”. This is very appealing as the color scheme is excellent and goes well with the flashy aspect. StarsDraft’s website gives you many unique features. This includes an outstanding dashboard that allows you to watch all your lineups perform live. It offers many excellent ways to watch how all your lineups are stacking up and is incredibly easy to track the positions in every game. Once you’ve established a roster on StarsDraft, one of the best parts of this website is that it allows you to join other games with a few clicks of a button while using the same lineup. Once you find a game you’d like to play, you simply have to click on a quick-enter lightning bolt. StarsDraft also lets you easily see entries and payouts to decide if the game is the right one for you. This illegality is because Daily Fantasy Sports are deemed illegal gambling within these states. StarsDraft can not be played within Canada. It is entirely legal to play StarsDraft, as Federal law considers Daily Fantasy Sports a game of skill instead of luck. This allows you to avoid the shadiness of playing on offshore websites. Fantasy Sports were made legal through the Unlawful Internet Gambling Enforcement Act of 2006. This legalization was because fantasy sports were found to reflect a player’s knowledge, as well as the study of statistical results, which excluded it from the federal government’s gambling definition. However, there are still several states in the US that deem fantasy sports betting illegal, and others that consider it a criminal offense. You must at least be 18 years old to play in any state. To withdraw or deposit money on StarsDraft, you must first input more information into the platform including your full address, birth date, and name. You can deposit money with most types of credit and debit cards including American Express and Discover. StarsDraft also lets you use PayPal. To withdraw money you have the option of having money deposited into your PayPal or sent by check. StarsDraft allows you to use all traditional debt and credit cards, as well as PayPal. Additionally, you may also use Bitcoin payments to play. There likely will be additional payment methods in the future. Withdrawals can be made by Bitcoin, Check, or PayPal. Depositing money on StarsDraft is especially hassle-free, easy, and quick. There is a minimum deposit of at least $20 and you can deposit up to $3,000 daily and $9,000 weekly. Creating an account on StarsDraft is remarkably straightforward. You can utilize your Gmail, Facebook, or email address to gain access to its platform. Matthew Primeaux, the former PokerStrategy.com chief revenue officer, initially started Victiv in 2014. It rapidly took off and soon held the number three spot in Daily Fantasy Sports operators in early 2015. Amaya is a big contender in the world of online gaming, especially with the purchase of the poker titan PokerStars at the start of 2014. Amaya also has sportsbooks and online casinos in some states. However, this is Amaya’s first entrance into Daily Fantasy Sports. The transition from Victiv into StarsDraft was quite seamless. Not too much has changed about the lobby and if you already have an account with Victiv then your login details will stay the same. Additionally, if you had any bonuses, tickets, or player balances with Victiv, then these will all roll over to StarsDraft. If you do not currently have a StarsDraft account, then it is worth it to check it out. Victiv originally was already one of the best Daily Fantasy Sports sites around, and with the input by Amaya, it will be hard to beat. StarsDraft will have all of your favorite games, as well as game offering for every major sport. It is up to you how much money you want to play with, as you can play for a slight or substantial amount. StarsDraft’s website is remarkably intuitive and easy to get around, and they are always looking to reward their loyal clients. It is also very easy to deposit and withdraw money from your account. Check out the daily fantasy sports gameplay at StarsDraft.com for yourself! "StarsDraft is a new daily fantasy sport wagering website that offers players the chance to create leagues from a plethora of sports games from NBA Basketball to NFL Football"